In Iraq and Syria it soon became apparent that Sunni Islamist forces, be it al-Qaeda, ISIS, or a plethora of other Takfiri Islamist groups, hated all and sundry. Hence, it wasn’t just a battle against the central government of Syria – or international troops on the ground in relation to Iraq. Instead, it was a literal survival for ethnic and religious minorities who were caught up in the Sunni Islamist storm of wanton violence and massacres. Similarly, for small indigenous ethnic groups in Rakhine (Myanmar) and for Bengali Hindus, the religious angle soon became apparent. 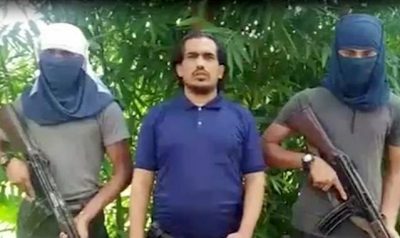 Therefore, the sword of ARSA (Arakan Rohingya Salvation Army) Islamist terrorism would target non-Muslim minorities despite these groups holding no power over Bengali Muslims in Rakhine. Sadly, if you view the brutal massacres against the Yazidis in Iraq by ISIS and note the same aim of ARSA against the mainly Buddhist tribe of the Mro in Rakhine and other small minorities including Bengali Hindus, then a pattern emerges. This pattern is that the Sunni Islamist sword seeks to crush the indigenous and all smaller ethnic and religious groups in Iraq and Rakhine respectively – just like Syrian Christians were attacked and other smaller religious groups in Syria. In other words, the Sunni Islamist sword is fighting against central forces and smaller ethnic and religious groups at the same time in order to cleanse entirely. Ironically, and of course, negated by the mass media, is that the armed forces of Myanmar were welcomed by the indigenous Buddhists, small ethnic Tribal Groups, Bengali Hindus, and others. After all, they all face ARSA terrorism, the Bengali Muslim land grab (just like Assam and the Chittagong Hill Tracts), and Islamist religious hatred of non-Muslims. Therefore, unlike the Yazidis who were abandoned when the ISIS Sunni Islamist sword came to butcher them and enslave Yazidi women because of the failure of central forces in Iraq – the various minorities of Rakhine were protected by the armed forces of Myanmar when ARSA tried the same tactic. Amnesty International, an organization that is anti-Myanmar in general, even highlighted massacres committed by ARSA Islamists against Bengali Hindus. In other words, even fellow Bengalis were butchered because they happened to follow Hinduism. Of course, this isn’t a shock to Bengali Hindus given the historical reality of being butchered by Islamist forces throughout history – irrespective if killed by non-Bengali Muslims or killed by Bengali Muslims. In this massacre by ARSA in the village of Ah Nauk Kha Maung Seik, it is known that Islamist terrorists even killed 23 Hindu children, of which 13 of them were under the age of eight. Hence, just like countless Sunni Islamist massacres against the Yazidis in Iraq, the sword of Islamism cares little about butchering non-Muslims despite these groups having no power within Iraq and Rakhine respectively. Of course, similar machete attacks and other brutal methods by Islamists in butchering Mro Buddhists and other non-Muslims in Rakhine are continuing in 2018. 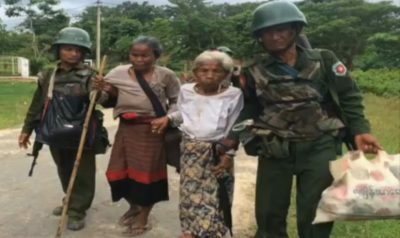 Therefore, the armed forces of Myanmar entered Rakhine to protect various ethnic and religious groups. If the army hadn’t entered Rakhine, then a further bloodbath against various non-Muslim groups would have ensued on a much larger scale. Hence, the government of Myanmar prevented the fate that befell the Yazidis in Iraq. After all, the Yazidis were abandoned by central forces and the international coalition that just bombed from the sky. Reuters reports that Islamist terrorists also killed Hindus for not converting to the Islamic faith. This agency says one witness, Bina Bala, stipulates, “We watched as they tied each person, hands behind their back and also legs … They cut all their throats and pushed them into a hole.” Hindu women who survived this attack did so because they converted to Islam. Of course, the objectives of ARSA and ISIS are different even if their hatred of non-Muslims is the same. For example, while both equally use the methodology of killing and intimidation, the ARSA angle is interwoven within the Bengali Muslim land grab that blights various non-Muslim indigenous groups in Assam (India), the Chittagong Hill Tracts (Bangladesh), and Rakhine in Myanmar. However, ISIS is focused on an international Sunni Islamist movement that will devour nation states – hence, the central governments of Iraq and Syria were being challenged by a movement that solely wanted a Sunni Islamist Takfiri state that would supplant the nation-state. ARSA, like the Sunni Islamist Taliban in Afghanistan and parts of Pakistan, seems more focused on the ethnic angle and behaving like “its string is being held by an external national or international entity.” In other words, the role of Pakistan and Saudi Arabia – and others – should be studied carefully. Likewise, the media over-distortion in the West and Islamic world is like the anti-Serbian Orthodox Christian bias in Kosovo (Serbia) – that was probably more aimed at appeasing Gulf petrodollars and reducing the leverage of the Russian Federation in the Balkans. Therefore, China and the Russian Federation in recent times are becoming increasingly alarmed by the same tactics being used against nations. For example, Libya and Syria were attacked based on mass media distortions and NATO and Gulf nations utilizing various Sunni Islamist terrorist groups on the ground. The nations of India and Myanmar should forge closer border policies in order to stem the tide of mass Bengali Muslim migration while pressurizing Bangladesh to act. Equally, just like China and the Russian Federation are preventing the diktats of the OIC, it is incumbent that India supports Myanmar over events in Rakhine. After all, India knows full well about Islamization by stealth, Sunni Islamist terrorism, and the Bengali Muslim land grab against the indigenous of Assam – and other areas of India. Therefore, India should be more outspoken in supporting Myanmar, especially given the legacy of countless Islamic invasions and the role of the British in cutting up this nation once the tyranny of both forces had finally come to an end. The government of Myanmar faces untold pressure to accept Bengali Muslims back into Rakhine in Myanmar because of the utter bias of certain Western and Islamic nations. Yet, if Myanmar is pressured then Buddhists, Hindus, and Tribal people have much to fear in Rakhine. This is based on Islamic terrorism and institutional religious hatred emanating from Sharia Islamic law that seeks to crush non-Muslims in this part of Myanmar. Similarly, when the demographic time bomb reaches majority status in Rakhine, then will the same pressures emerge in another part of Myanmar based on Islamization? 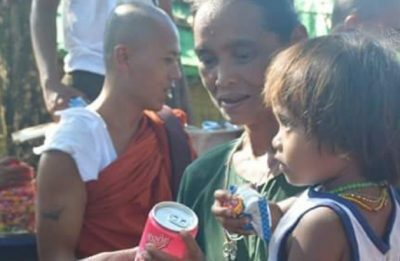 Indeed, Buddhists and other minorities in Rakhine only need to look at events in the Chittagong Hill Tracts and parts of Southern Thailand to see how Buddhists have been treated and the demographic reality that entails. In the case of Southern Thailand, then this scenario is happening despite the armed forces of this nation protecting Buddhists and Buddhist monasteries from Islamist forces. Overall, Myanmar needs to forge closer ties with important geopolitical powers including China, India, and the Russian Federation. At the same time, this nation should foster closer economic ties with China, India, Japan, Singapore, South Korea, and other nations based on positive relations. Likewise, Myanmar should strengthen ties with all regional nations throughout the Mekong Delta and other parts of Asia that encompasses nations including Sri Lanka. Equally important, Myanmar needs to focus on a media campaign and social media areas that highlight the role of the armed forces of Myanmar in protecting various ethnic and religious groups in Rakhine – for example, protecting the mainly Buddhist Mro to helping Bengali Hindus fleeing ARSA terrorism during the height of the crisis last year. After all, Myanmar faces an endless media and social media war – the role of Gulf petrodollars in manipulating events on the ground, in order to cover-up the deeds of major Western and Sunni Muslim powers that are butchering in Yemen – and the negative intrigues of Western powers that have eyes on dominating any nation that is independent.